The tourism industry in India has grown rapidly as tourists from all across the globe are irresistibly attracted to the rich culture, heritage, and incredible natural beauty of India. India has since introduced Indian E-Tourist visa for Canadian citizens making it easy to get a visa online. India with its foggy hill stations, captivating beaches, historical monuments, golden deserts, serene backwaters, pilgrimage sites, rich wildlife, and colorful fairs capture the heart of every tourist. Most tourists come to India to travel through the lovely Indian states and discover closely the resplendent colors and rich cultural locales of this incredible land. Not to mention, India coming in the top in the bucket list of wanderers across the globe has gained the Indian governments’ attention and lately, they liberalized the visa policies by implementing ETVs (Electronic Travel Visas). As per the Bureau of Immigration reports in 2016 around 40,000 Canadians visited India and the figures went up to 50,000 in 2017. This steady increase in the number is solely because of liberalizing the visa process by the Indian government. In the last year, we helped around 17,000 tourists process their visa application. This article will be your guide to the entire visa application process. Can Canadian citizens avail Visa on arrival at the airport? ETVs (Electronic Travel Visas) was introduced to replace the earlier existing Visa on arrival system, applying for which was a hideous task. ETVs were made effective from November 27, 2015. It is mandatory for tourists visiting India to have a valid ETV while arriving at India. Applying for ETVs have to be done online and it takes around 4 days to get the visa approved, so applying for an ETV from an airport after arriving in India won’t work. In fact, you will not be permitted to board your flight to India without a valid Indian visa. Therefore, anyone arriving at India without a valid visa will be deported back to their home country in the next flight. How long does it take to get E-Tourist visa for Canadian Citizens? The scrutinizing of your visa application done by officers from the concerned departments of the Indian Government is actually a bit lengthy process. It may take the officers 2 to 4 days to verify your application, approve it and email it to you. At any time, if the officers scrutinizing your application form is doubtful about any part of your application or is not satisfied with the documents you submitted you will have to submit some additional documents which the officers demand. Don’t forget to check your inbox often as you don’t want to miss any important correspondence from the government of India. You need to apply for E-tourist visa at least 4 days before you travel as per the website of the Indian government. We suggest applying 10 days prior to your journey. How many times can we enter India with a single Indian E-Tourist visa? Two entries are permitted on Indian E-Tourist & E-Business visas. Three entries are permitted only on E-Medical Visas. The visas are both non-convertible and non-extendable. How long is an Indian E-Tourist visa valid for? Indian E-Tourist visas are valid for 60 days, from the date of arrival in India. After you arrive at any airport/seaport you will have to get your passport and E-Visa verified by the immigration officer. Once your documents are verified your bio-metric details will be taken, the visa will be stamped and the immigration officer will write the expiry date of your visa in your passport. If you need a visa with longer validity and multiple entry benefits, you can apply for a sticker visa. You will have to take an appointment online and to submit your application at the Indian embassy. How much does it cost for India E-Tourist visa for Canadian citizens? For Canadian citizens, it costs CAN$62 for India E-Tourist visa. Apart from this fee, the credit card companies charge a service fee of 2.5% on the amount. We charge US$25 for our service If you want us to handle your visa application process. 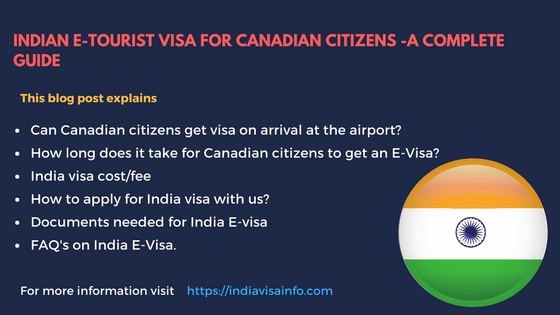 What are the requirements for India E-Tourist visa for Canadian citizens? Your sole objective of visiting India must be for recreation (sightseeing or tours) or casual visit to see friends or relatives. (Remember that this tourist E-Visa is NOT valid for employment purposes and NGO/volunteer activities. If you’re a journalist or if you’re visiting India for a conference, there is a separate visa for that which you can apply directly for at an Indian Embassy). Is it easy for Canadian citizens to apply for India E-Visa? Indian E-Visa portal is one of the abysmal portals one can find on the web. Poor maintenance and implementation results in the website crashing almost every time thereby making the website unreliable. One can expect the website to crash anytime unexpectedly because of these issues. The major issue arises while making the payment. The banks are incapable of accepting any online payments with ease. Servers may crash anytime because of poor maintenance resulting in payment failure. You need to keep in mind that only a maximum of 3 attempts is possible. Strike three and your application ID will be blocked. If you haven’t got enough time/patience to go through this annoying and irritating process you can avail our hassle-free service. You just have to fill in the below form and wait till our agents call you. Do you give any discounts if I want your help only with making a payment? We give a 50% discount on our service charge if you want our help only with making a payment. We charge only US$25. How many times can I apply for E-Tourist visa in a year as a Canadian citizen? Foreign nationals can apply twice for an Indian E-Visa in a calendar year (January to December). For longer validity visas with multiple entry benefits, you need to apply for a sticker visa. What should I do after I receive my E-Visa online? You must keep a printout of this document and keep it with you while you are in India as you may need to show it at some places. You will have to show the hard copy of your E-Visa along with your passport to the immigration officer at the airport for verification. Once your documents have been verified, you have to provide your fingerprints and photo (biometric information). Can I enter anywhere in India with my E-Visa? For medical tourists, separate immigration desks and help counters have been set up at Delhi, Mumbai, Kolkata, Chennai, Bangalore, and Hyderabad airports. We will apply for E-Visa on your behalf right after we collect information from you. You may need to give us 2 working days at most to procure your E-VISA. You can contact us if you need any help with your application at care@indiavisainfo.com or call us at +919632751222.